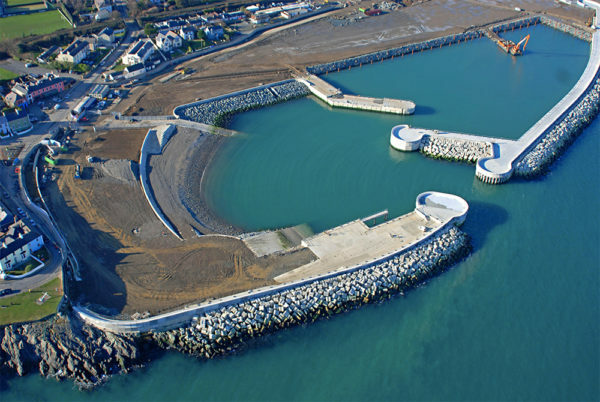 Hailed as one of Ireland’s most challenging civil engineering contracts, a £300 million marina and housing development at Greystones in County Wicklow is revitalising the town’s Victorian harbour which had fallen into disrepair. The PPP Greystones Marina project was delivered by Sispar, a joint venture between John Sisk & Sons and Park Developments, and comprised of a new harbour, construction of a marina, commercial units, luxury apartments and a new coastguard station along with significant reclamation and coastal protection works. The JV teams undertook €50 million worth of marine works including the construction of floodbarriers, breakwaters, quay walls and reclaiming land for the new marina basin, multi-user slipways for small craft, swing moorings for existing fishing vessels, reconfiguration of the beach in the existing harbour, a 230-berth marina and coastal protection works.